One of the top 20 most visited cities in the world, Prague attracts over 6 million tourists every year. 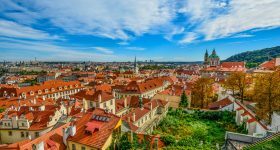 A cultural and historical hotspot, the city is home to some of the greatest and most timeless monuments in the world, including Prague Castle, St. Vitus Cathedral, Astronomical Clock, and more. Apart from these tourist attractions, Prague is also a haven for foodies and beer-lovers, serving up some of the country’s finest fare and ale. With so many places to see and things to do, it is pretty clear that Prague is a tourists’ goldmine. But how exactly does one navigate this city and make the best of their limited time here? The answer is simple - a Prague Hop on Hop Off bus tour. There are multiple tour operators in Prague offering the hop on hop off service, but there is one operator in particular, which is world renowned for its exemplary quality and service - City Sightseeing Prague. Part of the City Sightseeing Worldwide group, this company is the world’s largest open-top, double-decker sightseeing tour bus operator, offering its services in over 130 cities, including London, Paris, Dubai, and Singapore. 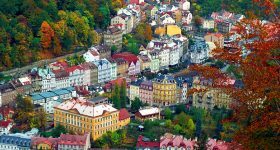 With such a wide reach and millions of happy customers, you can be sure that you’re going to have a great time on their tour in the capital of Czech Republic. City Sightseeing Prague offers various hop on hop off tours, including the traditional 24-hour and 48-hour pass, as well as certain combos and boat tours. 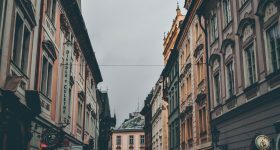 If you are looking to simply move around in Prague and observe the sights, the 24-hour or 48-hour pass should suffice. However, if you are looking to explore the attractions and have a more intimate experience, you can combine your bus pass with admission tickets to these attractions for a discounted price. 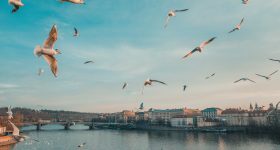 Moreover, you can even opt to combine your bus pass with a boat tour on the serene Vltava River and enjoy views of Prague from the calming waters. Click on the feature to know more about it. City Sightseeing offers 2 routes on its hop on hop off tours, the red route and the blue route, and they each have different stops, showing you the best of Prague. Both tours, however, begin in the beautiful Old Town Square, where you can see Prague’s medieval Astronomical Clock. The Blue Route takes you through Malá Strana to Lesser Town Square, where you can marvel at the Baroque sensation, St. Nicholas Church. From here, you continue on to Kampa Island, which was dubbed as the ‘second most beautiful city island in the world’. 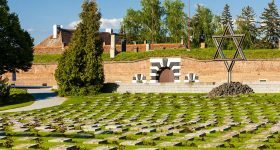 The final stop of this route is the Old Jewish Cemetery in the Jewish Quarter. On the red route you get to see a lot more of Prague as there are a total of 10 stops. Get a chance to explore Prague Castle, Malá Strana, Strahov Monastery and Stadium, Kampa Island, Hlvani Nadrazi, and I. P . Pavlova. The last stop on this route is at the Main Train Station. Blue Route: Buses depart every 25 minutes from 10 AM-4 PM. When it comes to the duration of a complete loop, the Blue Route takes 50 minutes to complete from start to finish. Red Route: Buses depart every 45 minutes from 10 AM-4 PM. When it comes to the duration of a complete loop, the Red Route takes 90 minutes to complete from start to finish. Apart from the Hop On Hop Off tickets, City Sightseeing also offers various complimentary extras to ensure you make the most of your tour. Complimentary Wi-Fi on board all their buses. Audioguide commentary in 7 languages (English, Spanish, French, German, Italian, Czech, and Russian), so you can learn about Prague’s history as you drive through the city. Complimentary 20-minute guided walking tour on the Red Route from Old Town Square to Na Florenci Street. About Explore Prague aboard an open-top bus and take in panoramic views of the city. Also included is a tour of Prague Castle and an hour long boat tour of Prague. Enjoy unlimited Hop-on Hop-off sightseeing transfers via special open-top double-decker sightseeing buses across 2 routes. Discover Prague on an double decker bus with commentary available in 7 languages, and then take an hour long cruise tour. 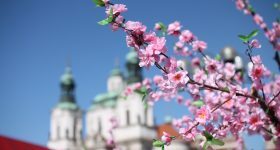 Optional: Prague Castle and Jewish Quarter tour. Flexibility: Perhaps the most unique and attractive aspect of a hop on hop off tour is the flexibility it offers. You are free to ‘hop-off’ whenever you want and spend much as time as you please at a certain attraction as you are not bound by anyone. Hop-on when you are done and move on to the next attraction. Savings: Prague hop on hop off bus tours are the most cost-effective way of exploring the city! You will be saving not only on transport to and from the attractions, but if you choose the guided tours, you will also save on the attraction tickets. Informative: Hop on hop off tours usually offer multilingual audio guides as part of the ticket. You get a lot of information from this commentary, and you also get the opportunity to learn more about the city’s history and culture, thereby making your experience all the more fruitful. Discover new places: These tours take you to all the attractions and points of interest across the entire city’s length and breadth. This tour not only gives you the opportunity to visit all these famous places, but also to places you wouldn’t have otherwise known about. Since you are travelling with a local, you will be exposed to a lot of the city you would’ve missed out on had you been travelling by yourself. Wherever possible, try to combine your hop on hop off tickets with a tour. That way, you'll get to explore the best attractions of the city with a guide, and without having to get separate tickets. Wear comfortable shoes as you will be doing quite a bit of walking. The bus stops at designated spots, and it is possible that your attraction may be a bit of a walk from there. Moreover, some of the attractions you visit will also involve quite a bit of walking, so it's best to wear good shoes. Guests aged between 3 to 15 can book the child ticket. See more Prague. Save more money. Born and brought up in Bangalore, Siddhant is a lover of all things football, Nadal and music. A part-time writer, he spends his free time reading, playing tennis/football and guzzling pitchers of beer at his favorite sports bar while cheering on the gunners. His favorite kind of holidays are those that involve sitting outdoors with friends and admiring the serene, quiet beauty around him. An avid foodie, Siddhant has the habit of signing up for gym memberships he'll never use.